Abstract: This interview-based article discusses how permaculture philosophy, practice, and education represent important avenues for sustainability-oriented hope and agency. 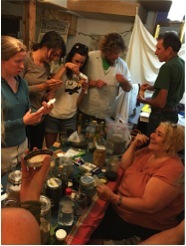 The author interviews Permaculture Design Certification instructors from the Central Rocky Mountain Permaculture Institute’s two week long course held in summer 2015. Interviewees offer perspectives on permaculture as a well-founded and well-developed philosophical approach to sustainability, as a framework for practical application of sustainability principles, and as a foundation for community organizing and development. The author seeks to inspire sustainability educators and practitioners to consider permaculture as an important vehicle for teaching, learning, and doing sustainability. Keywords: permaculture, Central Rocky Mountain Permaculture Institute, CRMPI, permaculture design certification, sustainability agency, community organizing, community development. Jerome is the Founder and Director of the Central Rocky Mountain Permaculture Institute (CRMPI) in Basalt Colorado, and the author of the book The Forest Garden Greenhouse: How to Design and Manage an Indoor Permaculture Oasis (2015, Chelsea Green). CRMPI offers the longest running permaculture design course in North American and perhaps the world. Jerome has extensive expertise designing and managing both indoor and outdoor permaculture projects, most notably CRMPI’s extensive greenhouses and forest gardens. At CRMPI, Jerome has created an incredible, high altitude microclimate that generates an abundance of fruits, vegetables, eggs, and meats (chickens and rabbits). Jerome is truly among the top permaculture designers in the world. Adam Brock is a social entrepreneur and teacher based in his hometown of Denver, Colorado. A co-founder of The GrowHaus, an award-winning food justice nonprofit, Adam works to help build a better future through sustainable agriculture, social justice, and regenerative economics. Adam is a TEDxMile High speaker, a winner of the Denver Post’s “Colorado’s Top Thinkers of 2013,” and a member of Denver’s Sustainable Food Policy Council. 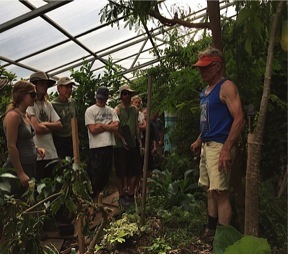 Adam was the lead instructor for the summer 2015 permaculture design certification course held at CRMPI. Isabel Sanchez is a permaculture designer, teacher, urban farmer and activist. For the past twenty years, she has been a passionate advocate for teaching self-reliance and sustainability in relation to the right to housing and food justice. These tools have brought her to Ecuador, Colombia, Honduras, and Mexico to work with indigenous communities on self-reliance, and she has learned a great deal from these communities in the process. At The GrowHaus, Isabel is the Program Director and also teaches about healthy, organic, affordable food to a food desert community. She is an artist and a mother of eight. Creighton Hofeditz grew up in Morrison, Colorado, and obtained a B.A. 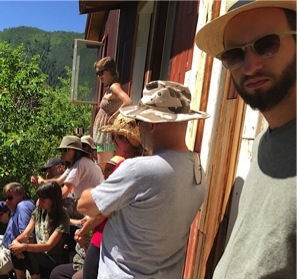 in theater and communication before switching paths with a permaculture design course at the Central Rocky Mountain Permaculture Institute in 2011. He worked with Peter Bane during the editing process of The Permaculture Handbook and has since designed home landscapes, a highway exit, and a curriculum for a permaculture-based Montessori school. Most recently he was a contributing author on Jerome Osentowski’s book The Forest Garden Greenhouse (2015). Creighton has placed special emphasis on greenhouses, perennial plant propagation, and community education. He is excited to settle back in Denver after serving as the intern coordinator at Bullocks’ Permaculture Homestead in Washington State, an he is on the steering committee of the Denver Permaculture Guild. Creighton loves the challenge of crafting unique, elegant, well-patterned systems in any environment. This past summer, I participated in the oldest running permaculture design certification (PDC) course in North America, and perhaps the world. 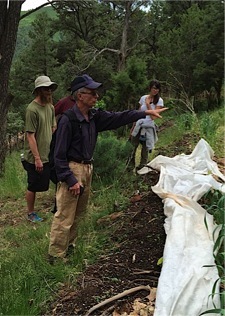 The course took place over two week’s time at the Central Rocky Mountain Permaculture Institute (CRMPI), a large-scale experiment in sustainable living and sustainability education. CRMPI’s mature outdoor forest gardens, four prolific greenhouses, expanding permaculture experiments, and classroom, camping, and living spaces are nestled into to the slope of Basalt Mountain outside the town of Basalt on the Western Slope of Colorado’s Rocky Mountains. The site, though very steep in most places, and accessible only via a very narrow dirt road that clings improbably to the mountainside, sits in a perfect “sun cup,” a southern facing drainage that captures sunlight and warmth as well as water to feed the luxurious growth of the permaculture food forests that, in turn, feed the people who call CRMPI home and visitors who are lucky enough to spend time there learning the philosophy and craft of permaculture. This main building at CRMPI contains Jerome’s residence and the CRMPI classroom space. I attended CRMPI’s PDC course along with my friend and colleague Becky Edmiston who teaches Biology and Sustainability Studies (SUS) courses at Colorado Mountain College where I am an Associate Professor in SUS. We chose CRMPI’s PDC course because of its relevance to the Rocky Mountain region where we teach (our campus is in Steamboat Springs); because of Jerome Osentowki’s extensive permaculture design, project implementation, and teaching experience; and most of all, because we wanted to learn from among the best so that we might offer a high quality PDC program in the future at Colorado Mountain College. Becky and I continue to work toward this goal. 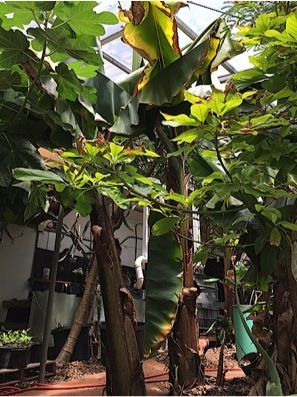 Banana trees growing inside the Phoenix greenhouse. A compost tea brewing set up sits behind the trees. Over the years prior to attending the PCD at CRMPI, I had read quite a bit about permaculture and had studied and taught about the Transition movement ignited by Rob Hopkins’ permaculture course in Kinsale Ireland (Transition is now a worldwide movement injecting resilience and vibrancy into communities in response to the twin challenges of peak oil and climate change). I had also worked with permaculturists such as Chris Holstrom of Tomten Farm near Telluride, Tom Reising formerly of Oakhaven Permaculture Institute, and others who had hosted service learning experiences for students taking my sustainability-oriented college courses. 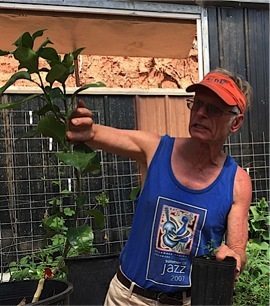 I had applied a number of permaculture and sustainability principles in my fairly extensive efforts in gardening, edible landscaping, orchard growing, and beekeeping in Durango, Colorado. But I wanted to know more. I wanted to really dig into the concepts and practice of permaculture, and I wanted to be able to share with students deeper perspectives on permaculture as a steadfastly hopeful practice of sustainability deeply rooted in individual and collective agency. 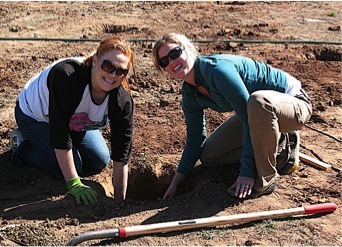 Students working on the early phases of what would become a fruit tree orchard of 100 trees on the Fort Lewis College Campus. 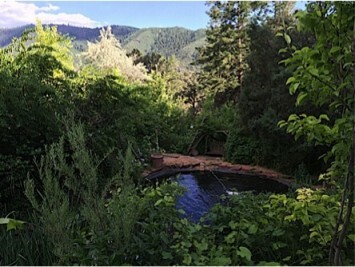 The author’s gardens at her past home in Durango, Colorado. 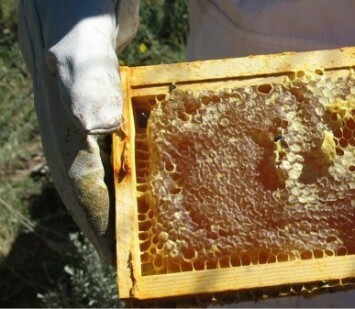 Honey harvested from college beehives managed by the author and students. Permaculture stimulates praxis, a conjoined approach to theory and practice in which a rigorous practice of reflection stimulates continual refinement of both one’s conceptual and practical approach to change. In their attempt to envision and live into being a more sustainable “permanent culture,” permaculturists unite sustainability principles relevant to households and communities everywhere with practices that bring their visions to life in gardens, greenhouses, water catchment systems, renewable energy installations, passive solar homes, aquaponic systems, compost operations, local businesses, and many, many more applications. Permaculturists also hone their powers of intense observation, experimentation, aesthetic creativity, and relationship building to foster the health of communities of plants, animals, and humans — purposefully creating relationships of mutual benefit among them. Permaculturists create appropriate living responses to both the bounty and limits of place. Jerome and students inside the Phoenix greenhouse at CRMPI. Setting limits to consumption and reproduction. Many of us may be most familiar with permaculture as an approach to food growing and production, but the ethical and design framework of permaculture extends into other technical areas as well as into the social realms of community building and economics. Permaculture is also highly adaptable to diverse situations and communities. There is no specific script for permaculture practice, only the widely set guideposts of the ethical and design principles quoted above. People who do permaculture create the movement as they go. In the process, they also create networks of grassroots activists who openly share their knowledge and experience. At CRMPI, along with my fellow learners and our instructors, I was joyfully immersed in the permaculture experience. As a permaculture project that has been lovingly tended for decades, CRMPI is a magical site for learning permaculture, and the course offers a wellspring of ideas, philosophical groundings, and practical applications sure to ignite one’s hope and sense of agency. I believe my fellow students were similarly inspired by their involvement. The forest garden at CRMPI, a truly lush, multistoried, polyculture landscape. 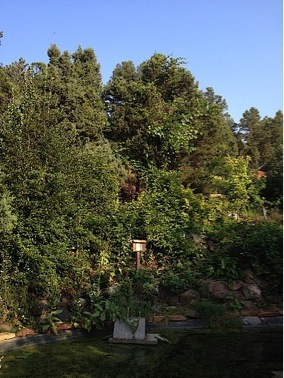 The multi-storied forest garden at CRMPI “stacked” into a hillside by the pond. Through the process of the PDC course, I learned that I have been a permaculturist for some time, though I had conceptualized my work as the thought and practice of sustainability. Just as am continually reminded through my sustainability education efforts, at CRMPI, I also discovered that I have much to learn. I realized that permaculture offers me additional pathways on my lifelong journey as a sustainability educator and practitioner, and I encourage other sustainability educators to embark on the permaculture path as an effective way to enhance and expand their teaching and learning efforts. Given the hope and agency inspired in me during my CRMPI PDC experience and my guest editing work for this hope and agency focused issue of the Journal of Sustainability Education, I invited the CRMPI PDC instructors to share in this article some of their stories as permaculture practitioners as well as some insights about permaculture and permaculture education as powerful vehicles for generating hope and agency. The remainder of this article is an interview with instructors of the CRMPI PDC. It is designed to convey some of the flavor and power of permaculture as a concept and practice as well as to share some specific, inspiring examples of permaculture work in the Rocky Mountain region of Colorado. I hope that you will be inspired to research these ideas and examples further as an inspiration for your own sustainability education work. Jerome teaching a fruit tree grafting workshop as part of CRMPI’s PDC course. Your Permaculture Design Certification course is the longest running such course in North America (30 years!). 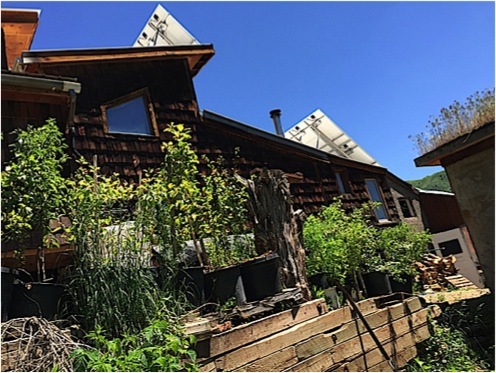 Also, your residence and learning/food production site at the Central Rocky Mountain Permaculture Institute (CRMPI) in Basalt, Colorado, houses some of the oldest food forests (both outdoors and in greenhouses) in the United States and perhaps the world. You’ve also written a new book, The Forest Garden Greenhouse (reviewed in this issue of the JSE) about best practices in permaculture greenhouse design and operation. Can you tell us about CRMPI’s permaculture growing successes to date? 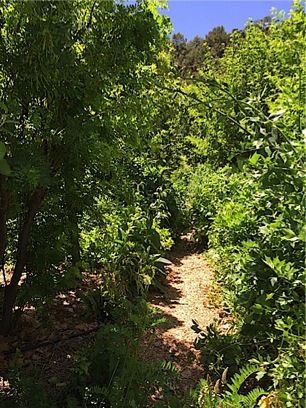 The forest garden at CRMPI is probably one of the oldest in the United States, with at least 20 years of perennial polycultures (multiple, mutually beneficial species planted together) grown at high altitude, representing over 150 varieties of fruits, vegetables, and herbs. We keep adding more plants every year — different varieties — and now we’re expanding to an acre on an eastern slope in the pinion and juniper using hugelkulture swales. Hugelkulture involves incorporating wood into swales designed to slow water drainage and promote infiltration of the water into the earth where you’re growing plants. It’s a Sepp Holzer technique in which the wood acts as a sponge for the water within the swale structure. These swales are planted with the idea of succession in mind, using ground covers, pioneer species, and root-stock-generating plants that will be followed later by planting annual food crops for a couple of years as we move into more perennial polycultures. This approach has been working really well for growing in our climate. What motivates your work as a permaculturist at this point in time? We finally have our book The Forest Garden Greenhouse (Chelsea Green, 2015) coming out this year. Chelsea Green invited us to write it, and in the book, we’ve documented our extensive work in greenhouse design, construction, and growing in partnership with Ecosystems Designs and architect Michael Thomson. We’re building greenhouses that are near net-zero with regard to carbon emissions, which is quite an achievement. The book also covers our work with perennial polycultures in the greenhouses and our climate battery technology for greenhouses that we’ve developed over the last 20 years. Climate batteries use the earth beneath the greenhouse as a storage medium for heat in order to maintain higher temperatures in the winter and disperse excess heat in the summer. Each year we refine the climate battery system further, and each year we build at least a dozen greenhouses in different shapes and sizes for different clients an implement some of the technologies we have been working on here at CRMPI for 20 years. As we work with our clients, we also learn from them and implement some of their ideas. It’s an ongoing process, and we are looking forward to doing a lot more design work when the book comes out. I’ll also be doing some teaching overseas — different workshops that will facilitate getting the message out about what we’ve learned at CRMPI. We would like to also eventually write a book on forest gardening. We’re excited about having The Forest Garden Greenhouse out as a platform to further our work, and I am grateful to all the people who have made the book possible: my book team and Chelsea Green. How do you see what you’re doing with the PDC and the food forests at CRMPI contributing to hope and agency for students and others associated with CRMPI? For the PDC course, we’ve come together with a really good team of teachers. We like to have a lot of diversity in our teaching staff as well as our forest garden and our greenhouse plant palate. Adam Brock is our main instructor, and we have four or five other instructors that teach their specialties with regard to permaculture. 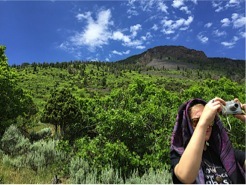 I also do my part teaching about the forest garden and greenhouses, and I and take people up on Basalt Mountain to plug them into the larger mountain ecology here, of which CRMPI is only a very small part. These hikes make people feel small but also intensely engaged with the ecosystem. As far as the CRMPI site goes and inspiring hope and action, I think many people know about CRMPI. Many people like to come out to our site to kick the tires on something that’s actually up and running and has some longevity, something that resembles what all the books talk about. At CRMPI they can see, touch, and feel a full-on, closed canopy, permaculture forest garden, a growing system that we’ve been working towards here for many years. This year’s experience is even better than ever because of all the rain we’ve had this spring and summer and all the extra mulch we were able to spread in our forest garden and greenhouses. The growth this year has been incredible and is something powerful to see. Adam and the PDC class outside at CRMPI. Discussion with Adam Brock: You led the comprehensive, well-designed and well taught PDC course at CRMPI this summer, and you are a co-founder of The GrowHaus in Denver — a community learning and action enterprise focused on local food production. The GrowHaus story is an exciting one of impressive results and continued promise for the Denver community in which it resides and also for others interested in starting a similar operation. Would you please provide a synopsis of The GrowHaus story to date? The GrowHaus is a food justice nonprofit based in an historic half-acre greenhouse in Colorado’s most polluted zip code. We initiated the project in 2009 when a local developer purchased the building with the intention of turning it into a hub for healthy food. I met him soon afterwards, and together with a crew of amazing volunteers and community members, we began a truly remarkable journey in community, justice and urban farming. Bit by bit, we were able to raise the funding to renovate the facility to incorporate commercial hydroponics and aquaponics farms, an educational demonstration farm and event space we’ve dubbed “Growasis,” and a farmstand that sells fresh, local food at wholesale prices. The residents of the surrounding community, which is largely Latino, were understandably skeptical of our efforts at first, especially because they’d been lied to by so many people in power over the past several decades. But we pursued an approach of protracted observation and small and slow solutions, responding to the real needs of residents and earning their trust. After three or four years, residents finally started to warm up to our presence, and today we serve dozens of local families every week with food boxes, educational programming, and business training. What I think we’ve all learned from the project — developers, administrators and community members alike — is that we truly are stronger as a group when we integrate our strengths rather than segregate them. Today, we have people coming from across the state and country to learn about our growing techniques and our unique approach to community development. Thanks to our careful application of permaculture principles, we’ve become a model for places across the country. Would you also comment on how this community enterprise is inspiring hope and agency? The GrowHaus has allowed residents of our community to build agency in a myriad of ways — large and small, intentional and unintentional. Alicia, for instance, was a graduate of our teen summer program that went on to become a staff member, teacher, and event planner for our community. Sandra started out in our herbalism class, moved on to our micro-enterprise training, and now makes a significant side income through her new catering business. On a broader scale, hundreds of families now have more confidence to purchase and prepare healthy food for their families and they feel like they are part of a powerful movement for social change in their neighborhood. Isabel leading an herbalism workshop as part of the PDC course at CRMPI. Discussion with Isabel Sanchez: As Program Director at The Growhaus, you are continually engaged in inspiring people of all ages to learn and to engage meaningfully, joyfully, and sustainably with others, the land, and the community. Your demanding but rewarding work organizing volunteers and instruction has a huge effect on a continually widening public. If you were to offer advice to other activists seeking to engage people in learning and action initiatives in their own communities, what are some of the most important insights and ideas you would share? I would advise other activists to get to know the people in their communities before trying to bring change. Take the time to listen to what the real needs of the people are, and don’t just assume what you bring to the table will equal what the needs of the community are. Take the time to be very gentle, to hear their cries, to hear their dreams, their wants, their needs. Become familiar with what they bring from their cultures. The more you take time to hear and learn from the community, the more trust will be built, which will create the opportunity for growing together and making change. Sometimes as activists we are very passionate about our own wants, but we have to be careful to really hear and support the community in what its real needs are, and by doing so, we create the most sincere change, openness, and dialogue. Another piece of advice I live by is being a living example. If you want to bring change, you must live the lifestyle of the change you are bringing forth. For example, if you are trying to encourage people to grow their own vegetables, it would not make sense if you do not have a garden. If you are trying to change people’s eating habits, it would not make sense if you are drinking pop and eating chips. We should be able to stand behind what we are trying to teach and live as an example. It’s not always easy to understand, feel, or walk in people’s shoes, and we think that bringing change is always the best way. But as you are working with the community, keep reminding yourself why you are there. Be sincere with yourself and others, be transparent and very clear, honoring the people who you are working with and receiving and embracing what they have to offer you as well. Discussion with Creighton Hofeditz: As a co-instructor for CRMPI’s PDC this summer, you shared your experiences as a permaculture designer and one who is on a continual learning path in permaculture. As everyone who delves into permaculture or other deep approaches to sustainability knows, once one begins the journey, new pathways for learning and doing continue to branch before us; it is a never-ending journey of discovery and meaningful work. What is your vision for the future of permaculture and permaculture education as platforms for human agency in the world? 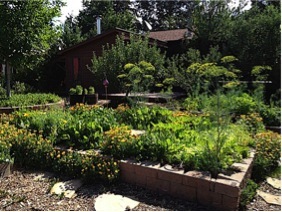 Several years ago, I worked on a curriculum for a permaculture-linked urban farm Montessori school in Denver. The pattern or theme I eventually settled on as my central goal was “young designers.” My thought was, what would happen if every child grew up feeling like they were empowered to be an everyday designer, to cultivate and enrich the land and people around them, that as humans they did not have to be a blight upon the world but could instead make smart decisions every day to make things better in tangible ways? What would happen if every community held regenerative processes, systems thinking, and a holistic earth care ethic to be normal, obvious priorities? I think most permaculture teachers will tell you that their ultimate goal is to teach themselves out of a job, and in the world I’m suggesting with these questions, I doubt there would be very many permaculture teachers. The key is not to hold permaculture out as something separate from our lives — no matter how exciting — but to get to the point where its methodology and worldview is indistinguishable from our lifestyles and our culture. If we ever arrive at something resembling that idealized world, though, it will be through a lot of evolution and applied feedback. I see this change as a generational process that will be probably most challenging for those people who are most steeped in the permaculture movement today. I know from experience that it’s incredibly tempting to feel like you’ve uncovered all the answers and to cling tightly to them, but nature holds no dogma, so neither should we. With all this in mind, the most crucial task I see for the permaculture movement is to apply its own principles to itself more seriously. In the educational realm, we continue to teach a paradigm-shattering design science (the PDC) in a mostly conventional way. The demographics of those taking these courses skew to the white and middle-class, and the leaders of the movement are overwhelmingly white and male. A problem-solving approach that is fundamentally about living better with limited resources is often seen as inaccessible to lower-income populations. There are some understandable and predictable reasons for all of this, and it is slowly changing in positive directions, but if we fancy ourselves the craftspeople of a better world, we must continue to hold ourselves to a higher standard. If we limit our practice of diversity, integration, valuing the marginal, self-regulation, and observing before action to the plants in our garden, we will be doing ourselves a deep disservice. The good news is that I believe we’re heading in the right direction. We’re part of an ecological succession, where what came before lives to be reshaped and remade by the next element to come along. By most standards, I’m still a child in my permaculture path, but I couldn’t be more excited about the future. I envision design courses that change locations every year and revitalize landscapes and communities in need while placing graduates in a thriving network of mentors and apprentices that operates like a spiral, expanding outward while constantly circling back to improve upon the experience of every new student. 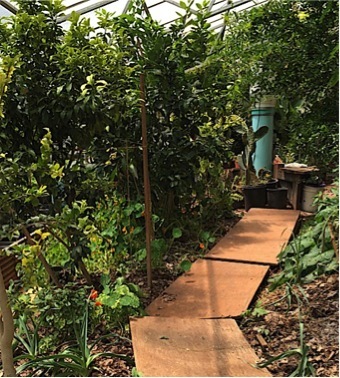 As the diversity and skill of graduates grows, the permaculture message can be tailored and taught to groups of people who might not otherwise ever come into contact with it –this is already happening in some sectors. And most importantly, if we’re lucky and brave enough, increasing diversity, radical integration, and changing leadership will circle back to inform, evolve, and remake the movement again and again. In many ways, the permaculture ethos can be expressed as a series of questions and litmus tests to gauge the resiliency of a system. In that spirit, here are some questions that are on my mind these days as a new permaculture educator: Am I teaching patterns, process, and holistic thinking, or am I teaching received knowledge and dogma? Who am I teaching, and why are they here? Who is not here, and why not? Am I challenging myself to be continually remade by the feedback I get? Am I listening to and serving the young designers? Many thanks to the permaculture educators who contributed to this article. I hope their words the their works inspire you to explore and use permaculture as a vehicle for engaging students, community members, and friends in hopeful, sustainability-oriented learning and doing. More information about CRMPI is available via the Institute’s website: http://crmpi.org/. See the Transition Network online (https://www.transitionnetwork.org/) and Hopkins’ books The Transition Companion (2011, Chelsea Green), the Transition Handbook (2008, Green Books), and The Power of Just Doing Stuff (2013, UIT Cambridge). See Holmgren’s book Permaculture: Principles & Pathways Beyond Sustainability (2011/2002, Holmgren Design Services).